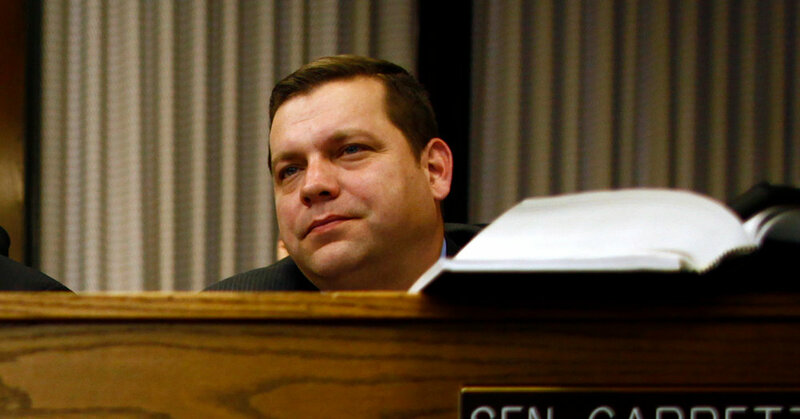 WASHINGTON — Representative Tom Garrett, Republican of Virginia, announced Monday that he is an alcoholic and that he will not run for re-election in November in order to seek treatment. “Any person — Republican, Democrat or independent — who has known me for any period of time and has any integrity knows two things: I am a good man and I’m an alcoholic,” Mr. Garrett said in an emotional video statement released by The Washington Post. The announcement followed a week of whiplashing rumors about Mr. Garrett’s congressional office and plans for re-election. Several unidentified former staff members accused Mr. Garrett and his wife of requiring personal favors from employees, such as grocery shopping and pet care, according to Politico. Mr. Garrett’s chief of staff also left his position last week. Mr. Garrett, 46, is a member of the House Freedom Caucus and represents Virginia’s Fifth Congressional District. He is the 44th Republican in the House to announce his retirement before the November election. “Substance abuse is a serious issue that reaches even to the halls of Congress,” John Whitbeck, the chairman of the Republican Party of Virginia, wrote in a statement Monday on the party’s Facebook page. But after Mr. Garrett’s unusual news conference and the report regarding his treatment of staff members, Republicans now may have a better chance at holding the conservative-leaning district in November. Because the filing deadline to run for office in Virginia has passed, party officials will decide on a nominee. A number of Republican state legislators represent districts that overlap with Mr. Garrett’s sprawling House seat, which stretches from the Washington exurbs to the North Carolina border. Mr. Garrett was to face the Democrat Leslie Cockburn, a former journalist who already had more cash on hand than the incumbent. As of last month, Ms. Cockburn, a former “60 Minutes” producer, had over $270,000 to spend. According to Mr. Garrett, his decision to retire was motivated solely by his alcoholism.